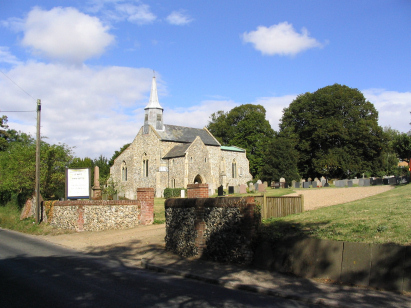 The parish of Hellesdon lies just north-west of the City of Norwich, indeed nowadays it is one of the suburbs and contiguous with the urban development. The oldest parts of Hellesdon are those along the edge of the valley of the River Wensum, the more modern development having taken place along the "High Road" and the flatter land to its east. The riverside portion of Hellesdon is rather a pleasant place of leafy cottages and plush suburban homes, it is a contrast to the 60s and 70s development of low-rise homes on the hill. 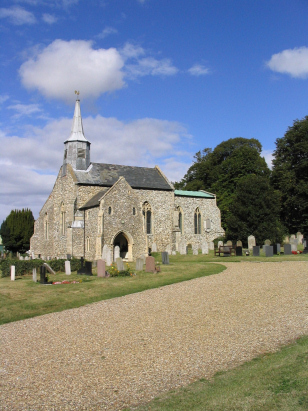 St Mary's church sits adjacent to the "Low Road" in the older part of the parish and is old for Norfolk with much of the 12th century and a ground plan which suggests pre-Norman age for the structure. There is no tower but a leaded bell-tower is a rather attractive feature. The churchyard adjacent to the busy road is pleasant and the northern end rather nicely wooded. The records forming the basis of this transcription constitute a single standard 800-entry register book. This book has been filmed on Microfilm MF1399 in the collection of the Norfolk Record Office. This film is one of the more recent batch and is of very good quality with clear and contrasting images, the records too are rather well preserved giving good readability. There are minor issues with some of the handwriting but this is normal. This was a straightforward transcript to prepare and hopefully few errors will have crept into its compilation.